I will never joke about someone who is meticulous being OCD again. It isn't a joke. Being organized or clean or meticulous is not OCD. I loved this book, and I felt so bad for Molly, who slowly falls deeper and deeper into counting by 4s, washing her hands, organizing her bedroom, and worrying about her healthy younger brother dying of some freak accident or disease. 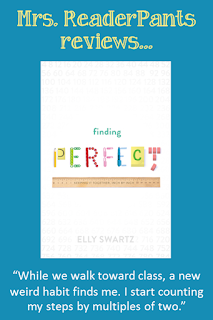 Finding Perfect is a very necessary addition to every school library. SUMMARY: Twelve-year old Molly's life is falling apart, and no matter what Molly does to keep it perfect, she fails. Her mother moved to Canada and doesn't seem to be coming back. Her father works all the time. So Molly starts keeping her room perfect. Her homework perfect. Her hands perfectly clean. But it's never perfect enough. And then she starts counting by 4s. Is she going crazy? REVIEW: I loved this beautiful and sad portrayal of what daily life is like for people who suffer from obsessive-compulsive disorder, or OCD. Molly washes her hands 44 times in one day. She counts by fours, constantly. She considers her own name no-good, simply because it has five letters. She lines up her glass figurine collection with a ruler several times each day. She doesn't like that she does these things, but she can't seem to stop. Molly is a believable heroine, as are her parents, siblings, and friends. She's a popular girl in school who gets good grades. No one knows about her secret, and she isn't sure how she could ever tell them because she's sure they'll think she is crazy. Molly's parents are very real, and for that reason, I don't want to beat them up for their inattention to what's going on with Molly. I felt angry at both of them for their laser-focus on their careers, but at the same time, I know many parents would miss Molly's problems. They were both guilty of being inattentive parents, but they are human beings who really do love their children. I'm not excusing them; I'm saying they represent so many of today's overburdened, stressed out parents. THE BOTTOM LINE: Highly recommended for every school library. Even though the protagonist is only 12 years old, I could see high school students and even adults benefiting from the spotlight on OCD in this book.